This special blend of mostly leafy plants is predominantly used in Tibet and Nepal to call different spirits who work with shamans, so the shaman can ask the spirits to help with the healing work they are doing the ceremony for each individual who received the “blend blessing” to take home and burn to have the plants clear the mind while burning and inhaling the vapors. 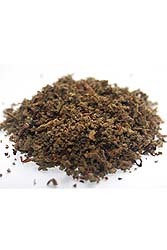 Also sold as an Herbal Smoking Blend called Himalayan Spirit Clearing Mint Blend. Ingredients: Pure shade dried herbs and herbal oils of Blue and White Lotus, calamus, neel leaves, wild marigold, wild peppermint, wild chrysanthemum flowers, Indian sarsapilla, cistus, mugwort, Acacia, Artemesia, Scullcap, Himalayan fir, eucalyptus, myrrh, mullein, wormwood, Woodruff, and a proprietary powder blend, from a shaman in Nepal.